Designed for sport or leisure. The rider kneels or lies in the prone position. 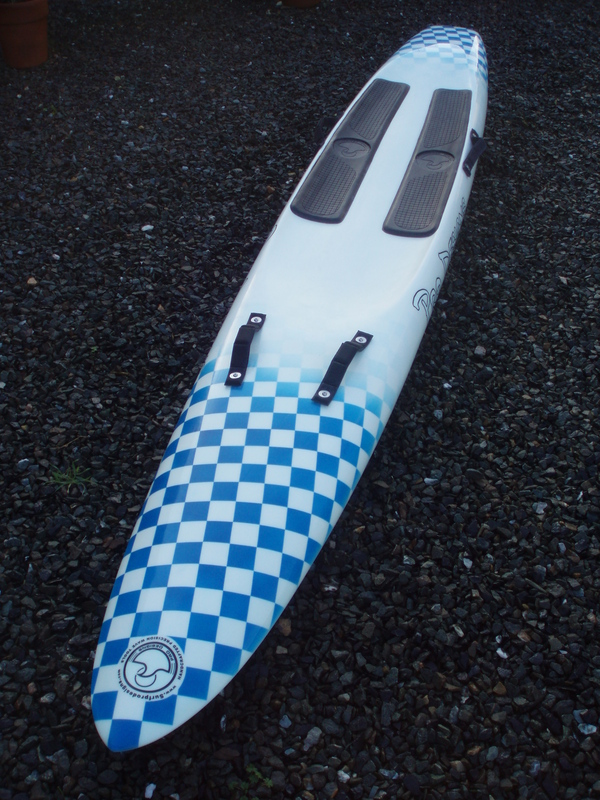 These prone paddle boards are handcrafted and custom made for the individual, not mass produced in some far of land. At Surf Pro Designs "You have custom made what you need, not purchase what is in stock". If the customer is unsure of what they need, a friendly chat will inform Alan (the creator) as to the predetermined shape that's required. Shaped and handcrafted using a light weight coolite/EPS foam core (see workshop this web site) the first stage artwork is then applied. Allowing main artwork to be placed under the laminate, and be fully protected. Only the very strongest, clearest Epoxy resin is used to laminate the glass or Hybrid laminate to the shaped core. Extra reinforcement is applied to all impact/high load area's. Numerous filler coats and further laminates are applied along with detailed artwork as specified. 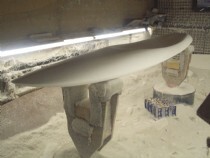 The paddle board, then having its final coat of resin is meticulously hand polished to a high gloss. 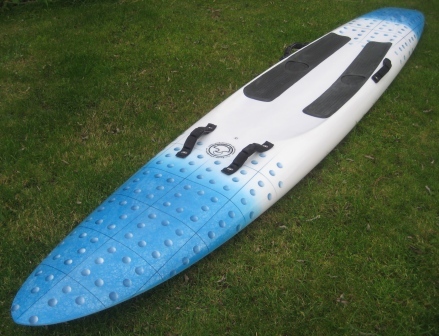 Unlike other manufacturers that spray paint artwork or lacquer their final coat offering very little protection to cosmetics and graphics of the board. Though primarily for race use, there being a length limit of 3.20m boards up to 8.0m can be built on special request, see below. 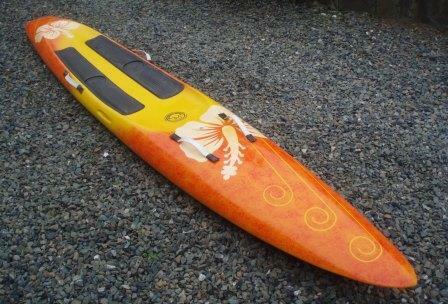 For long distance coastal paddling (becoming very popular) we would recommend Open Ocean Paddle boards upwards of 12ft. 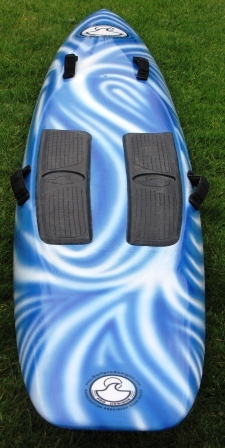 This will allow the board to have more glide between strokes making it efficient and user friendly. 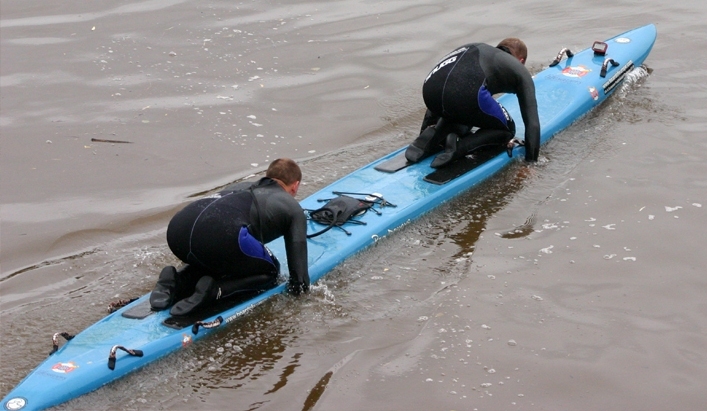 Needless to say these Paddle boards may be used in flat water for recreation and fitness. The four grab handles are attached to the board by machine head 6mm stainless screws, over a 20mm stainless washer, screwing into an injection moulded fitting with a integrated 6mm stainless insert. Corrosion is therefore eliminated. Our own unique designs have evolved over two decades with feedback from our sponsored competitors. Meticulously built to your exact requirements using information you provide in our free quoteform. Your own artwork (whatever it is), incorporated at no extra cost. Please view other examples. Note: Chameleon Fire-Flake artwork is now available as an extra. Extra long knee pads supplied. No more sore feet. 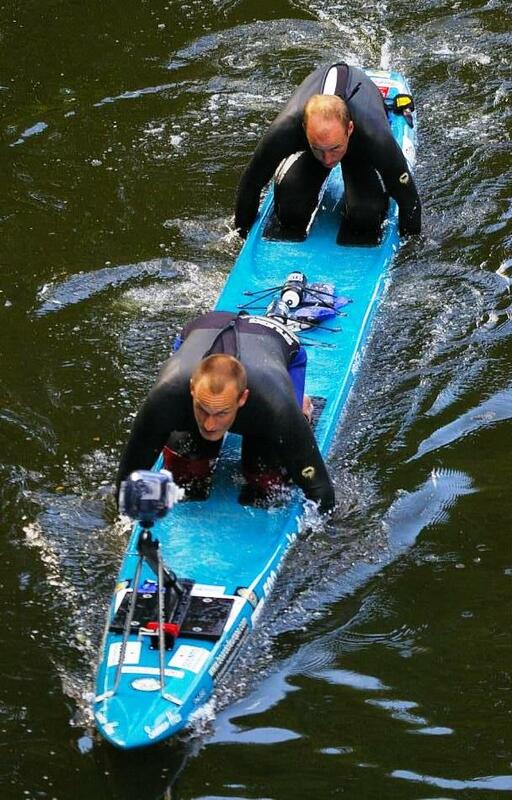 Whatever your weight, experience or ability, a Surf Pro Design paddle board can be built for you.